We’re moving swiftly through the month of May- hard to believe! Sara Weythman has been hired as our new Teacher Librarian. We are currently hiring for two instructional aid positions and sixth grade. Additionally, because of careful planning, we were also able to budget for a part time counselor for next year (yay!) and this position is also posted on the Office for Catholic Schools website. Thank you for helping to spread the word as we work to fill these important positions! Happy Mother’s Day to all you mothers, and thank you for the way in which you show God’s love to your children. During the month of May, we also celebrate our mother in Heaven, Mary. We do so in a special way on May 13, the 101st anniversary of her first appearance to the children at Fatima, Portugal, which is fittingly Mother’s Day this year. Be sure to celebrate our Mother Mary this month in some special way! Last week, the school children crowned Mary and brought flowers to adorn her altar. If you have a statue or image of Mary at your house, consider doing the same. Here is a printable bouquet and vase for coloring. 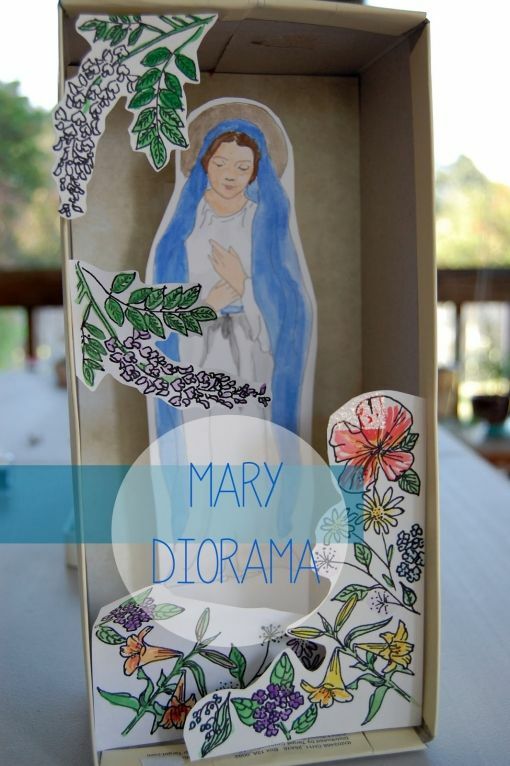 If you don’t have a statue or image of Mary, then have your child/ren make a diorama with a shoebox! Or make a little shrine with a picture of Mary out of Popsicle sticks or aquarium gravel here so that you have a place to put some flowers. In the Church, sometimes we fast. But sometimes it also important to feast! The colors for Mary are blue and white. Make a special dessert with this in mind. One suggestion is angel food cake with some blue glaze on top. When Mary appeared on May 13, she promised that she would give the children, and all, a sign. On October 17, 1917, 70,000 people gathered, and were treated to a show as the sun danced in the sky. Have your children create their own dancing sun. Pray the rosary together as a family, or perhaps just a decade. Together, ask Mary to watch over and protect your family. To prepare, have your child/ren color some pictures of the mysteries of the Rosary that you are going to use, or of Mary herself. Pray/Learn the Memorare together – my favorite Marian prayer. A reminder that tomorrow is pizza lunch! Talent Show Next Friday, May 18! We are pleased to share another wonderful talent show with the Holy Rosary community! The theme this year is beach vacation, and all students can wear free dress in this theme. Flip-flops are okay too! This theme is guaranteed to make you excited for the summer! We have many students who are sharing their diverse talents with us. The first act will begin at 9:30 with the Holy Rosary band and continue with our kindergarten through fourth grade performers. Our second act will begin at 1:15 with all of our grade 5-8 performers. The eighth graders will conclude our show with their annual eighth grade dance. This might be a bit earlier than normal, so make sure to arrive a bit early if you are an eighth grade parent. Be a room parent for the 2018-2019 school year! If you enjoy planning and attending classroom parties, parent’s nights out, and spoiling the teachers with birthday gifts, then this job is for you! Room parents fill such an important role in each class and help take a little weight off our teacher’s shoulders. This time spent also goes towards your family commitment hours. If you are interested in being a room parent during the 2018-2019 school year or would like more information on room parent responsibilities, please contact Joellyn DeRonghe at joellyn17@hotmail.com. Thank you! June 15 – Last day of school. School dismisses after Mass. The Tiny House elective is looking for paint donations. If you have extra paint that you want to get rid of we would love to get it. We need: a gallon of an exterior darker color like red, green or blue, an exterior quart or more of white, and an interior gallon of a white or light color. You can email Mr. Ritscher at mritscher@holyrosaryws.org to arrange pick-up. Thanks! Please remember to return all library materials by Friday, May 18. All books must be returned (or fees paid) in order to get report cards on June 15. Thank you! The book fair returns for three days on May 29-31! It’s a highlight for students and parents alike, and this fair is double the fun and twice as nice, because its BOGO! When you buy one item, you get the second lower cost item free! As usual, the book fair needs volunteers, so sign up here today! Questions? Contact Mr. Barker at jbarker@holyrosaryws.org. Sign up here to volunteer for fall 2018-19 recess duty. First trimester runs for 10 weeks from September 11-November 17th. Recess duty is from 11:15am-1:15pm. ANNUAL FUND – If you made a pledge at the beginning of the school year, and you are not making payments, please fulfill that pledge NOW. If you have NOT had an opportunity to make an annual fund donation, I urge you to help us reach 100% participation in the ANNUAL FUND. No amount is too small. When applying for grants, a higher percentage of family participation informs the granting committee that we have exhausted our internal resources and increases our chances of obtaining additional funds from outside sources. Currently we are at 67%. A big thank you to those that participated in yesterday’s GiveBig and to all the families that have participated! Every dollar helps us reach our goal! Click here to make a donation. AUCTION DECORATIONS – Are you creative? Love to choose colors and décor? Then chairing the auction decorations sound like the perfect fit for you. During the months leading up to the auction evening meeting attendance is required as well as a few Saturday work parties. The day of the auction you will lead set up, but may still attend the event that evening. AUCTION PROCUREMENT – Are you organized? Does the word NO not deter you? Then you may be just who the auction committee is looking for to take charge of procurement. A team of volunteers is in place to do the legwork and make follow up calls, but a leader is needed to coordinate the catalog details. And keep the group moving. Join Pack 793 at Youth Adventure Day on Saturday, May 12 from 10-3 at Schoenwald Park. Youth Adventure Day is a free day of fun activities open to the public, for boys and girls aged 5-12. Planned activities include: archery, pinewood derby, rock climbing, BB gun shooting, Dutch oven cooking, orienteering, fire building, wrist rockets, geocaching, robotics, and s’more! This is a great opportunity to experience scouting. For more information contact George Panger (glpanger@hotmail.com) or visit the Pack 793 website. May 16, 7 p.m. – Band Festival at Kennedy Catholic High School gym. Required, graded performance. ALL permission slips should now be in. 2018 Honor Band members have their concert schedule information. Kennedy Catholic High School – Elementary summer band camp is July 9-13 this year!! Time: 12:15-2 p.m. Tuition: $25. Discount for siblings available! One year band experience required. Held in the music room of Kennedy Catholic High School. Online registration here only. Miss McKamey wants to see YOU there!! We welcome your child to a Life with Christ! Baptism – Interested in your child (birth up to age 7) becoming Catholic, please contact Deyette at 206-937-1488, ext. 251 or dswegle@holyrosaryseattle.org. RCIA – For those children 7 years and older who are interested in becoming Catholic, please contact Sr. Stella at 206-937-1488, ext. 251 or srstella@holyrosaryseattle.org. First Reconciliation and First Communion – Registration will be open for First Reconciliation and First Communion by the end of May on the Parish website. Children who have been baptized Catholic and will be in grade 2 or older next year are welcome register. For those children who are not Baptized and are interested in becoming Catholic, please contact Sr. Stella at 206-937-1488, ext. 251 or srstella@holyrosaryseattle.org. Children’s Liturgy of the Word (CLOW) – Your child (preschool through grade 4) is welcome to join CLOW at 10:30 a.m. Mass to learn about the readings of the day. Children start Mass with you and are dismissed after opening prayer and return before Celebrating Communion. Free and no registration required. Sunday Nursery – Holy Rosary Church offers free childcare (age 1 and walking up to age 5) on Sunday morning during 8:30 and 10:30 Masses in our Parish Center basement preschool space. Please go to the door facing Genesee St. and ring the doorbell. For questions, please contact Deyette at 206-937-1488, ext. 251. Holy Rosary is offering Rosary making with youth; sixth graders through high schoolers. Please join us on Wednesday, May 30, from 6:30-8:30 p.m. at the Parish Office conference room. There’s no cost and all Rosary materials are provided as well as pizza! You are also welcome to bring something else to eat if you like. For questions, please contact Sr. Stella at email srstella@holyrosaryseattle.org or 206-937-1488, ext. 251. Young Adult Softball – We’re forming a team with Christ Our Hope to play in the CYO Adult Softball League. Games will be on Tuesday or Thursday evenings, from June 5 through August 2. Contact David at youngadults@holyrosaryseattle.org to register. All skill levels welcome! Monday Rosary – Join us every Monday evening to pray the Rosary in the Chapel from 7 to 7:30. For more information, contact Deyette Swegle. Unlock the Mystery of the Bible! Join us for an eight-week overview of the entire Bible on Saturday mornings at 9:30 in the Parish Center! Great for beginners or for review! Our next meeting will be Saturday, May 12. Jesus: A Pilgrimage – Come follow in the footsteps of Jesus with James Martin, SJ’s book on discovering Jesus in the Holy Land. We meet Wednesday mornings at 9:30 in the Parish Center! Our next meeting will be Wednesday, May 16. Walking with Purpose – Due to popular demand, WWP is hosting a book discussion for women on My Sisters the Saints by Colleen Campbell, not only Wednesday evenings at 7:15, but also Friday mornings at 9:15 (May 4-June 8) in the Parish Center reception room. If you can’t attend all sessions, drop in as your schedule allows. For questions or if you need childcare, email Deyette at dswegle@holyrosaryseattle.org. Walking with Purpose – Save the date for our next book discussion, Heaven Starts Now by Father Ricardo on Wednesday evenings at 7:15, June 6-July 25. For questions email Deyette at dswegle@holyrosaryseattle.org. Sunday School for Grown-ups meets on the first and third Sundays of each month in the School Room 7A. Our next session will be on May 20, on the topic: “What’s a Pente Cost?” Join us to discover how the Church was born, and how the Spirit of God can change your life! Looking for a fun way that your entire family (children welcome to help) can participate and still go to Mass? Look no further than Sunday Coffee & Donuts after 8:30 and 10:30 Masses. It’s super easy and a great way to gather family and friends to serve. Click here to learn more and/or sign-up. The Archbishop of Seattle is asking all parishioners to participate in the Annual Catholic Appeal, supporting our CYO summer camps and youth and young adult programs, college campus ministries, Catholic Community Services and their ministry to those in need, the formation of our future priests, and many more ministries throughout the Archdiocese. Everyone’s support is crucial. Please consider the gift of $1 a day, $365 total, or more if you are able. Any money we receive over our goal will go toward replacing the broken parish bus, which is used for our women’s shelter, to transport homebound parishioners to Mass, and field trips for the school and Seniors group. Thank you for your generosity. West Seattle Drums offers private lessons on drum set and snare drum. Call Mike Grueter at 206-938-3563 for lessons or visit our website for more information. Special offer for Holy Rosary students – get one introductory lesson for free! Click here for more information. My name is Katie Hooks and I am a 2013 graduate of Holy Rosary School. I graduated from Holy Names in 2017 and have just finished my freshman year in the Honors Program at Loyola University Chicago. I am available this summer to tutor your student in Spanish, reading, math and/or study skills. I have transportation and can come to your home. I tutored Holy Rosary students last summer, worked for the City of Seattle as a reading tutor through the TeamRead program, served as a peer tutor in Spanish at Holy Names for two years, and I tutor Spanish-speaking third graders in Chicago in reading and math. Rates are $20 per hour for one student and $30 per hour for two students. Contact me at k.kellen.h@gmail.comor or 206-465-6566.